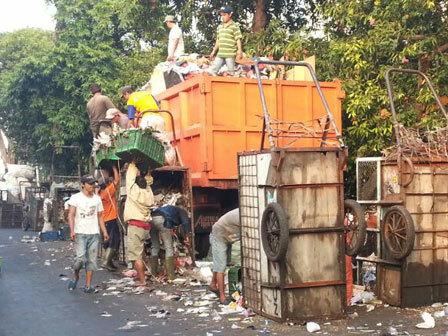 Seven waste dumping site (LPS) locations along Sentiong River, Kemayoran sub-disrict, Central Jakarta will be closed.
" For closed LPS located at RW, we will provide motor cart"
It will be replaced with waste depot in cooperation with Kemayoran Complex Management Center (PPKK). Kemayoran Sub-district Head, Herry Purnama said, LPS that will be closed is located at RW 02 and 03 of Utan Panjang Urban Village; LPS on Jl. Kali Baru Barat, Kebon Kosong Urban Village; LPS at RW 02, 05, and 06 of Serdang Urban Village, and Kemayoran Gempol LPS. According to him, 1,000 square meters land owned by Ministry of State Secretariat will be used as eco-friendly integrated waste dumping site (LPST) by using depot concept. "That 1,000 square meters land is located on Jl. Kemayoran Gempol Ujung or Marto Bridge at RW 09, Kebon Kosong," he said, Monday (8/7). Meanwhile, Central Jakarta Environment Sub-dept. Head, Marsigit added, depot construction progress is still in auction phase. It is considered the process can be done in this week. "For closed LPS located at RW, we w ill provide motor cart. Thus household waste can be transported directly to the new depot," he closed.